This post is sponsored by Omaha Steaks. Sponsored posts, along with affiliate links, are what enable bloggers like me to maintain and operate sites that are free to the public. That said, I only work with products and brands that I personally use and would feel proud to give as a gift. Even if you’re new to ordering meat online, a concept that is rapidly growing in popularity, chances are you’ve heard of Omaha Steaks. It’s the time of year where kids start searching the lawn for eggs, bunnies visit homes to drop off candy, and families sit around the table for a feast. 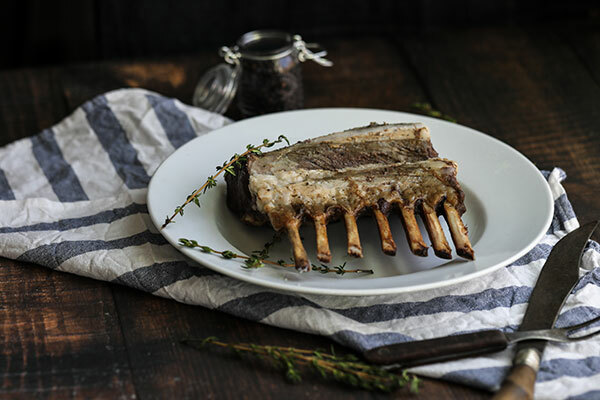 This Easter, I’ll be making one of my favorite traditional dishes: Rosemary Crusted Lamb. It’s always an impressive and delicious dish to serve. Letting the kids watch the lamb on the rotisserie is also a great way to keep them distracted while you hide Easter eggs. The other reason I use the rotisserie is because of the self-basting that happens during the process (which you’ll see in my video below). If you don’t have a rotisserie you can absolutely use your gas or charcoal grill, employing indirect heat to roast the lamb. 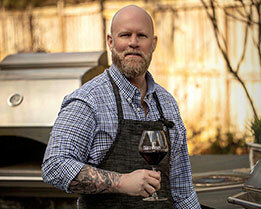 I outlined this technique in my book, Grillseeker: Basic Training for Everyday Grilling. 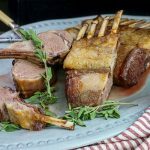 My homemade rosemary salt and a little olive oil are all you need to make this dish the best lamb ever. I get my lamb from Omaha Steaks and it is probably the highest quality lamb I’ve ever had—and I eat a lot of lamb. Coming from Omaha, the racks are already frenched, which cuts down on prep time and makes for the perfect presentation. Frenched lamb chops also provide all your diners with the perfect “meat handle”, so you can all feel free to grab the bone and dig in. Serves: 4 | Prep time: 10 mins.| Cook time: 25 mins. Step 1: Rub racks of lamb with 1 tablespoon of olive oil each and dust both sides with rosemary salt. Step 2: Place lamb racks on rotisserie spit in opposite directions, and lock down the clamps. Step 3: Place spit on rotisserie with a foil-covered drip pan under it to collect any drippings. Step 4: Close lid and allow to cook for 20-25 minutes with your grill set to high, or until the internal temperature is to your liking. I prefer medium rare lamb so I serve it at 128°F-130°F. Step 5: Remove from heat. Let rest for five minutes before slicing and serving. 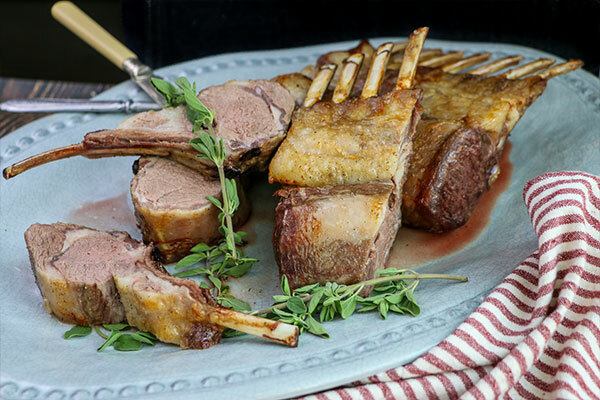 A showstopper main course for any Easter table, this herb crusted rack of lamb recipe pairs perfectly with buttercream eggs, chocolate bunnies, and jelly beans. Rub racks of lamb with 1 tablespoon of olive oil each and dust both sides with rosemary salt. 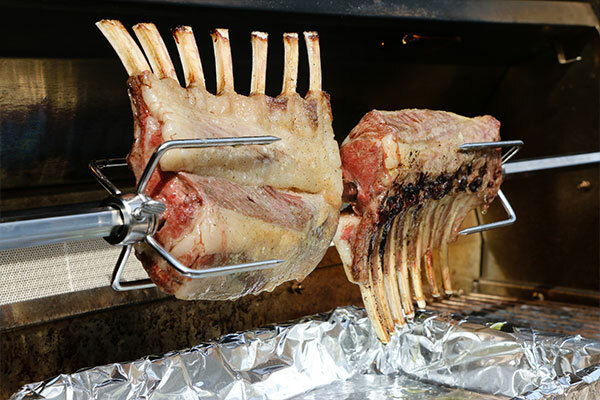 Place lamb on rotisserie spit in opposite directions and lock down the clamps. Place spit on rotisserie with a drip pan beneath the racks to collect any drippings. Close lid and allow lamb to cook at a high temperature for 20-25 minutes. Remove from heat. Let rest for 5 minutes before slicing and serving.